To honour the outstanding achievements and career of Ole Einar Bjørndalen, most successful biathlete in sporting history, CERTINA launches a special limited edition version of its two-time-zone GMT Chronograph. With the same unmistakable sport-classical design that has made the line famous, this new exclusive edition now comes with an additional stainless-steel bracelet and a certificate of authenticity. One very stylish timepiece to match your sporty travelling life and excellent taste. Keeping close track of time is an important part of every successful person's journey. Nowhere is this more so than for a top-level athlete such as Ole Einar Bjørndalen. CERTINA's newest DS Podium celebrates Ole's brilliant career and brings you the power of a two-time-zone 12-hour chronograph in a sporty, irresistible timepiece. The DS Podium GMT Limited Edition features an ETA quartz chronograph movement inside a 42mm case equipped with a reinforced case back, engraved to show its unique production number and Ole Einar Bjørndalen's signature. 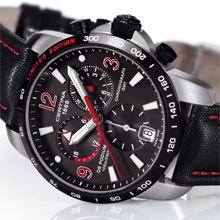 The PVD black bezel, crown and push-buttons, and a contrasting white tachymeter scale with the words "Limited Edition" in red, attest to the uniqueness of this special timepiece. The black dial and various indicators in boldly contrasting shades make for easy reading under all lighting conditions, thanks to Superluminova treatment on the main Arabic numerals at 9, 12 and 3 o'clock (in red) and on the HM, GMT/24h hands and indices (in white). A sapphire crystal, essential part of CERTINA's renowned DS Concept, protects the dial and its three counters, including a twin-function 12-hour and 60-min. chrono indicator, a small second counter and a special GMT time zone counter. A red central hand displays chrono seconds, while the date window is conveniently placed at 6 o'clock, for excellent legibility. The DS Podium GMT Limited Edition is water resistant up to a pressure of 10 bar (100 m) and comes in a special display box with an additional, stainless-steel bracelet to complement the exquisite woven-look and red-stitched black strap, and a certificate of authenticity. In any time-zone or sporty situation, the new DS Podium GMT Chronograph Limited Edition is a valuable timekeeping ally in your winning, global schedule.